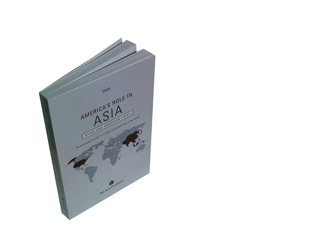 America's Role in Asia is a 310-page volume of recommendations on U.S. foreign policy for the new administration from some of the world's preeminent American and Asian experts. Their analysis and insight came out of a year of closed-door summits convened across Asia and the U.S. by The Asia Foundation. Completed just prior to the presidential conventions last fall, we created a sophisticated rollout strategy aimed at getting America’s Role in Asia (ARA) into the hands of every influential advisor on both campaigns. Our ads complement that strategy with the aim of conveying the seriousness of the content, while evoking rich cultural aspects of Asia. The ads feature brilliant, arresting Asian images and elegant artwork in a palette of plums and golds, with crisp language to quickly attract and communicate with our audience. Targeting changemakers, foreign policy advisers and other influencers, our first ads ran on Foreignpolicy.com, and Newsweek.com, leading up to our Washington and San Francisco releases. Ads then ran in The Washington Post.com, and in a targeted “Today’s Headlines” New York Times blast. Finally, at dawn on the day President Obama took office, we ran a dramatic, rich ad at the top of The New York Times inauguration blast, offering “Foreign Policy recommendations for President Obama”. The entire campaign funneled unprecedented web traffic, dramatically overtaking all previous records; the final New York Times blast resulted in the highest ever number of visitors to our site in a single day, tripling our average: 10,790 visitors.